Normalize spectra - The fluorescence laboratory. For plottting and analysis purposes a|e provides a one-click shortcut to normalizing UV-Vis absorption and emission spectra, either normalization at a single wavelength or normalization of the area below the spectrum. For some purposes, such as decomposing spectra, having the area-normalized spectra of the individual components is convenient. 1. Go to Tools->'Normalize spectra (area)'. 2. A spectrum selection window is opened. Select the spectra to normalize and press OK. The selected spectra are now normalized to a total area of 1. You can use the integration tool to verify this. For plotting purposes spectra can be rescaled so that the absorption/intensity value at a certain wavelength is 1. In this example, three emission spectra are normalized at different wavelengths. 1. Press the 'Normalize selected spectra' button in the toolbar. If no spectra and wavelengths are selected using the data cursor tool a selection dialog box will be opened. 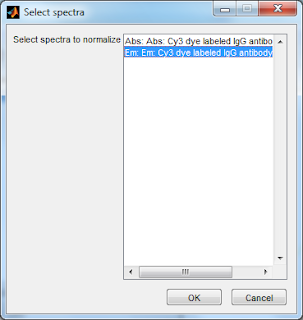 Select the desired spectra in the dialog box and press OK. Since no spectra were selected using the data cursor tool, normalization will in this case be done at the wavelength corresponding to the peak value of the spectra. 2. If the spectra should be normalized at a wavelength different from the peak value, use the data cursor tool to mark the desired wavelengths on each spectrum. In this example, the spectra are normalized at the lowest energy peak of the emission spectra. 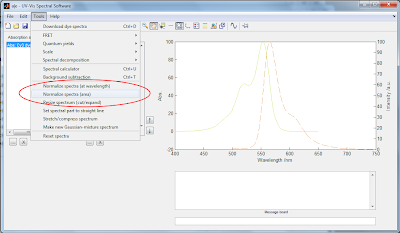 Once the correct wavelength at each spectrum has been selected using a data cursor press the 'Normalize selected spectra' button in the toolbar again. In this case, all spectra marked with a data cursor will be normalized at the wavelength of the cursor.